In this session Esteban shares his experience in the design and implementation of a solution aimed at managing operational efficiency in medium and small companies, based on big data systems and developed with the WSO2. Their system generates an enriched integration ecosystem, dynamic and agile business process management, and online analytical information of customized management KPI. Together they provide information about the operational efficiency degree, allowing companies to understand, analyze, and predict the behavior of these indicators in real-time. The main virtues of their system is the flexible design given by MongoDB, the natural integration with a service-oriented architecture provided by the WSO2 Enterprise Integrator, and also a powerful online information analytics tool provided by the WSO2 Stream Processor, R programming, and Apache Kafka. Their advice and implementation methodology give them the ability to adapt to any client need by implementing specialized connectors, dynamic configurations, and system customizations for each client without altering the performance for all clients that share resources in the same platform. In this way they lower the implementation costs and their clients pay only for the resources they use, making this technology more accessible. 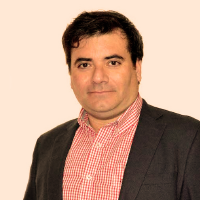 Esteban Zelada is a Computer Engineer with extensive experience in management, design and implementation of various information technology projects and services. Specialist in systems integration technologies from Oracle, IBM, Jboss and WSO2. Oracle University Rapporteur for Oracle Fusion Middleware systems. Experience in the development of Technological Innovation projects, looking for solutions that support entrepreneurship, automation and information analysis, through tools such as Arduino, Big Data and SOA. Professional who seeks to make a concrete contribution, based on constant learning and improvement, and always participating as one more element of the business value chain, contributing with quality and excellence to both professional work.